What is the Amazon Echo Plus? With the Amazon Echo, we got a neat body for the Alexa digital assistant. It provided a way of controlling all of our smart home devices by voice command, as well as being a wireless speaker. Since the Echo first launched, the range has expanded. We’ve got the miniature Amazon Echo Dot, the touchscreen Amazon Echo Show – and now with the Echo Plus, Amazon is taking things one step further integrating a Zigbee hub. The idea is that this could be the only smart home device you need, and you won’t need an array of hubs plugged into your network. It’s a step in the right direction, but a few software limitations hold the Plus back for now. Place the Amazon Echo Plus next to the original Echo and, new silver colour option aside, it’s hard to tell the two apart. The new model is the same size and height as the old one (235 x 84 x 84mm) and has the same controls: control button, microphone disable and the rotating volume control. I’m particularly pleased to see the volume control remain the same; it’s a nicer, more premium option than the Echo 2’s volume up/down buttons. There are a few minor differences to the Amazon Echo Plus at the back, compared with the Echo. First, the power input has been moved to the rear, rather than the underside of the unit, which makes plugging it in that bit simpler. There’s also a 3.5mm audio output at the rear, which lets you plug the Echo Plus directly into a stereo if you’d rather not use its internal speaker. Alternatively, you can use Bluetooth to hook the Echo Plus up to a separate wireless speaker. Setup of the Amazon Echo Plus is the same as for all other Echo devices, using the Alexa app (iOS, Android) or via the web. Once you’ve paired with the new Echo, you just hook it up to your Wi-Fi and you’re good to go. I had mine working in a matter of minutes, with Alexa responding to my questions straight away. It’s worth renaming your Echo, particularly if you want to use the call and drop-in features, where you can make voice calls from Echo to Echo, either inside your home or to a contact. Alexa performs all of the jobs you’d expect a smart assistant to do, including weather reports, calendar appointments (even from G Suite accounts, which Google Home still can’t connect to), and answering simple questions. I think the Google Assistant is smarter and, straight from the box, is easier to interact with, but Alexa’s expandable range of skills means that you can use an add-on to make the voice assistant do pretty much what you want. In terms of power and range of services, then, Alexa is still top dog. It’s with smart home control that the Amazon Echo Plus sets its self out as something a bit different. Thanks to that built-in Zigbee hub, the Echo Plus can connect directly to any device that uses this protocol, such as the Philips Hue and Ikea Tradfri light bulbs, and the SmartThings Outlet. There’s a fair range of Zigbee products available, but it would have been better if Amazon had also included Z-Wave support, too. That way, you’d get the same level of product coverage as the SmartThings hub provides, including support for the Yale Keyless Connected Smart Lock. Pairing with any device natively means that you don’t need to install a matching skill. If the Echo Plus can’t find any new devices, a help screen shows you different steps you can take to detect a device. For example, with Hue bulbs, you can enter the six-digit serial number into the app to have Alexa reset them to factory defaults. Newly discovered devices are listed in the app and given a basic name. My Philips Hue light strip was given the name ‘Light One’, for example. Devices are listed alphabetically, and there’s no way sort by different criteria, such as date added or type. If you’ve got a lot of smart home devices, I recommend using the Groups option to bundle multiple devices together. It is good to see that devices can finally be renamed inside the Alexa app. That helps avoid any name clashes caused between smart devices from different systems, say having a Sonos player, light bulb and heating system all called ‘lounge’. With the original Alexa app, sorting wasn’t important, as you had to control everything with your voice. With the updated software, that changes and some smart devices can be controlled via the app. Tap on any light bulb, for example, and you can set the brightness and turn the light on or off. This works for both natively connected light bulbs and any that are connected through a skill. This is neat, as app control is often more convenient than voice control, and Alexa pulls all of your smart devices into one app. This is similar to how Apple Home works, giving you the option of using both an app or Siri to control your smart devices. Amazon needs to do a bit more work, aside from improving organisation. First, some devices don’t have any app control and I couldn’t adjust my heating, for example. Secondly, control is very basic. Although I have colour-changing Hue bulbs, the app only let me change the brightness, not the colour. At the moment, then, buying the Hue Bridge and using Philips’ app gives you more control, and it’s a similar story for other smart light bulbs. And, while you can pair Zigbee remotes, buttons and motion sensors, there’s currently no option to do anything with them. Instead, these devices just sit in the app, unable to communicate with your other devices, such as light bulbs. That’s a little disappointing. Routines are a new option added to all Alexa devices, letting you perform a string of commands when you say the phrase you set, such as, “Alexa, good morning”, or at a set time. Actions include giving a traffic update, reading news headlines, giving a weather update and controlling smart home devices. It makes Alexa potentially more powerful, as you do quickly perform multiple jobs with one phrase, such as getting your morning dose of news, while turning the lights on. Smart home control needs more work: you can control smart lighting, but smart heating control is very dependent on device. I found that I couldn’t control Nest or configure an Evohome Zone; I could enable Evohome quick actions, though, such as setting the system to Away, which drops the temperature to 15°C. Annoyingly, you can’t control Alexa groups in Routines, and have to select each device that you want to control manually. Routines show another discrepancy between the Amazon Echo Plus and Hue: with the Plus, Hue bulbs appear singly; if you use the Philips Hue Skill, you get an ‘All Hue Lights’ option to control everything at once. 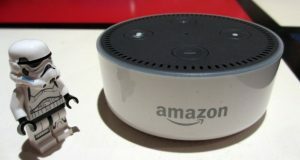 It’s all a step in the right direction, and if Amazon can improve in-app control, Routines, and the ability to use Zigbee controllers, Echo will have a simpler unified control scheme than the rival SmartThings. Amazon has revamped the internals for the Echo Plus, with the 2.5-inch downward-firing woofer and 0.8-inch tweeter powered by Dolby. On paper, this makes the Echo Plus the best audio performer in the range. However, side by side with the original Echo, the changes sound minor. I found the Echo Plus sounded a little sharper, with more pronounced bass, but it still suffered from many of the same issues as the original speaker. That’s to say that at low-to-mid volumes audio is a clear, detailed and balanced and well suited to a kitchen or occasional listening, but whack the volume up and the sound gets harsh and starts to distort. Certainly, if you’re looking for a speaker designed for audio, then the Alexa-powered Sonos One could be a better bet. Why buy the Echo Plus? The underlying Alexa ecosystem keeps improving, and the majority of the new smart home features (app control and routines) are available on all existing devices. The Plus, then, stands out because of its integrated Zigbee hub. Yet, at the moment, this needs some work to improve features with connected devices. Philips Hue bulbs, for example, have more options when connected to a Hue Bridge. I expect the Amazon Echo Plus to improve over time, but for now, it’s not quite the device to unify everything in your home. Currently, smart home users will be better served with a standard Amazon Echo or Amazon Echo Dot, sticking with manufacturer-provided bridges and Skills. A neat attempt at unifying the smart home, but the Echo Plus needs a few improvements before it works perfectly.